As we have done for a number of years, we publish the blossom records for the National Fruit Collection at Brogdale, undertaken and kindly supplied by Lorinda Jewsbury. These are records for a selection of varieties (standards and any new accessions) from all the tree fruit collections at Brogdale, Kent. So far this season, the blossom in the NFC orchards has (in general) opened a couple of weeks earlier than last year. 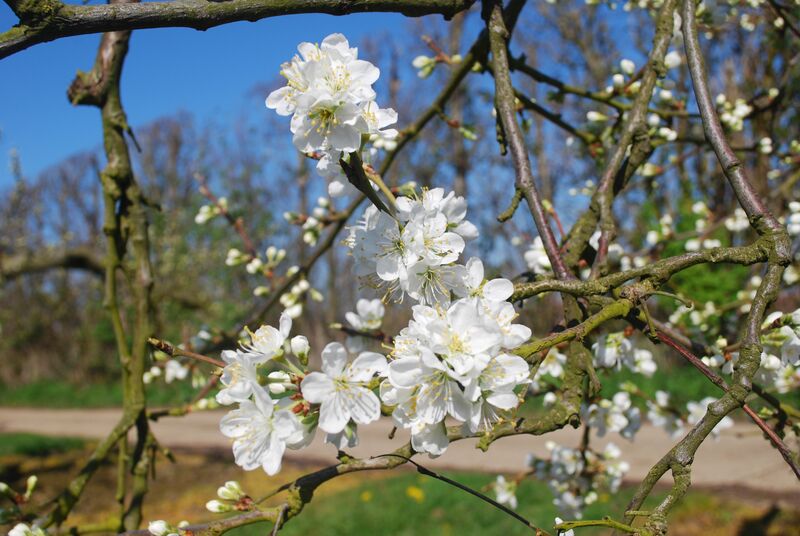 Some varieties took advantage of the mild March weather, with the plums, pears and a few of the early cherries in particular opening their blossom 6-8 days earlier than their recorded 10-year mean. However, a dip in temperatures and some pretty cold nights held the rest back and brought them more into line with their 10-year means. The past couple of days have been much warmer here at Brogdale and the forecast for the Easter weekend is for even higher day-time temperatures. With brighter days and warmer nights, the coming weekend should see the apples and cherries really spring into action. Just this morning I noticed a handful of apples that had by-passed the 10% mark and fully opened 25% of flowers in one go. Although a few tend to do this each year, the number was quite noticeable today. Next week is likely to be a busy one for recording blossom, if the weather holds as predicted, and most of the remaining varieties should be open for business. Morello cherry 23 April 2018 at National Fruit Collection, Kent. In flower 10 April 2017. Here in North East Wales, no doubt due to the long chilly spring, we all have experienced in the UK, I have the peculiar anomaly this year of every early flowering fruit tree being late to flower and catching up with the later flowering trees. I cannot recall this unusual happening before but I have only kept accurate records from when I moved here in 2006. I’m keeping a record of what will and what won’t grow here in the Vale of Clwyd where we have a micro-climate and unusually low rainfall for North Wales. Things are certainly looking toward a bonus crop of fruit for me this year if the later fruit set on the peach and apricots is anything to go by. The hot dry weather from last week has pretty much suddenly burst everything into blossom in an overlapping cycle of events. The plums just overlapping the pears and the cherries overlapping the apples. 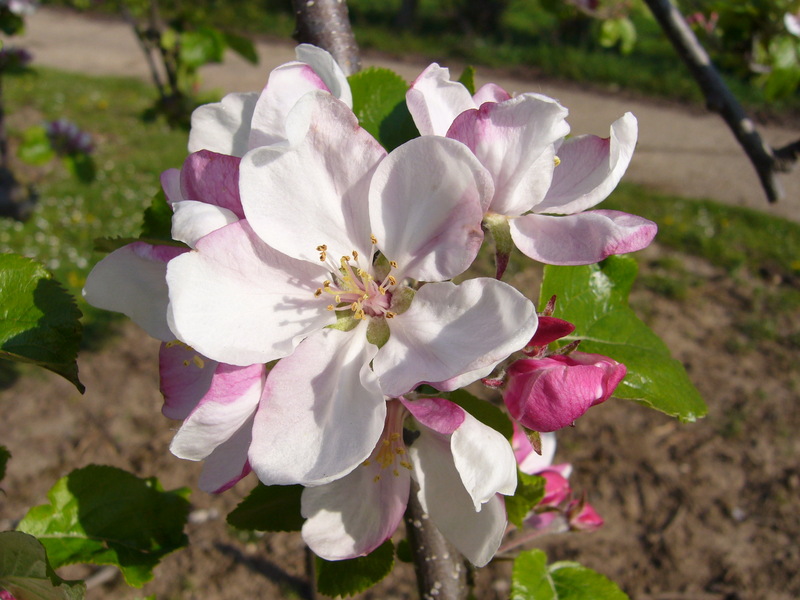 Right at this moment on the 27th April I have just into blossom 4 out of 6 apple trees, Charlotte first into flower on 24th April with Scrumptious, followed by Flamenco on 26th, Greensleeves is just opening its first flower buds today. The two Laxton Superb trees are just at the pink bud stage this year. Four pears: Beth was first with masses of blossom open on the 21st April this year, followed by Conference, Comice, and Williams’ still in flower. Also still in blossom 8 plum trees: Denbigh Plum, 2 Jubileum plum, Marjorie’s Seedling (also a mass of blossom this week), 2 Opal plums, Ontario plum and Victoria. The Victoria and the two Jubileum plums were first to flower this year on 18th April, closely followed by Opal and Denbigh, last was Marjorie’s Seedling on the 24th April. 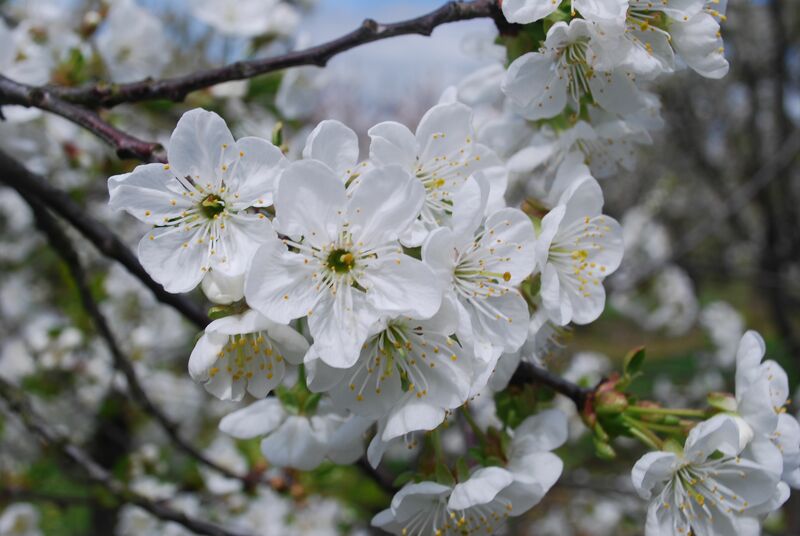 Cherries in flowering sequence this year were: Summer Sun, Early Rivers, 21st April, then Kordia on 23rd, Stella and Morello just starting to flower this week on 26th April. All three Apricots (2 Tomcot and 1 Large Early) and peach Redhaven all flowered later, in early March (under cover). 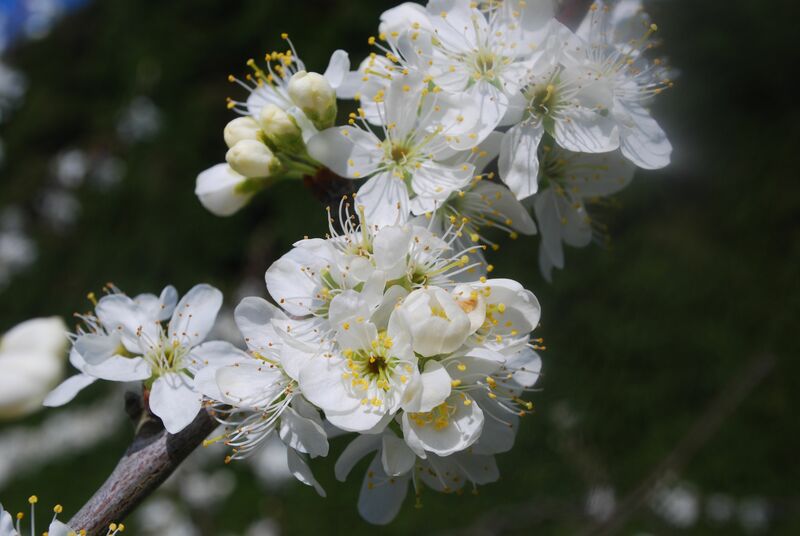 As we have done for a number of years, we publish the blossom records for the National Fruit Collection at Brogdale, undertaken and kindly supplied by Lorinda Jewsbury. These are records for a selection of varieties (standards and any new accessions) from all the tree fruit collections at Brogdale. The flowering season is once more under way in the orchards at Brogdale. Many of the plums have reached full flower and the remaining varieties should not be too far behind. The warm, sunny weather a week or so back saw a good number of pears opening their blossom and some of the cherries began to follow. However, the weekend was a different story weather-wise and the chilly weather that came in has certainly put the brakes on the flowering for now. As for the effect of the chill on the open flowers and fertilisation process, we shall just have to wait and see.